Once again Naxos digs into the Marco Polo film music catalogue to retrieve an old friend for revivification. It first appeared on Marco Polo 8.223315. 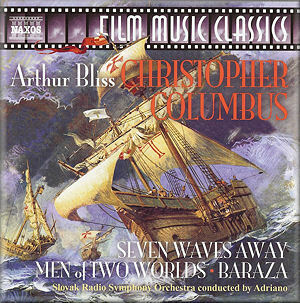 Christopher Columbus is heard in Adriano’s arrangement of the 1949 Suite. It’s a hefty-ish undertaking at twenty-five minutes or so. Spanishry is rife in this salty and swashbuckling opus, though the effect is symphonic and not bitty. This is principally because, for example, Adriano has allowed the main titles to expand into the overture which means the opening now lasts not far shy of five minutes. The shortest cut is The Messenger [track 5] which lasts barely a minute. The Commission (track two) takes in three successive cues, the first of expressive seriousness, and the second urgent and terse. There’s a luxurious cue for Doña Beatriz (track 3 - I won’t go into the plot, it’s pretty obvious and standard fare) but its musical virtues are strong. One can feel the gusts and billowing sails in The Voyage begins. Mutiny is a montage of cues, whilst the processional that pictorialises Columbus in chains is equally visceral. The brassy ceremonial Bliss is off the leash in the final cue, Return to Spain - not the Bliss of his brief Fanfare, but more the chest swelling brilliance and grandeur of the Blow Meditations, a few years into the future. Seven Waves Away followed in 1956 - again it was nautical, this time the story centring on the tribulations of a lifeboat crew. Three pieces have survived in manuscript. At the time no print was available to Adriano so though Bliss clearly wrote more music than the eight and a half minutes presented here, it couldn’t be reconstructed beyond that amount. Adriano’s evident admiration for what does survive however is clearly justified. The first cue is taut and tense and intensely powerful, and the central Allegro shows Bliss’s assurance in more compressed moments - it’s only two minutes in length. The final funeral march with its tolling mien is an extended cut of four minutes and adds symphonic grandeur. Baraza was extracted from the film Men of Two Worlds as a concert piece for piano, orchestra and men’s voices. It was recorded on a Decca 78 by Eileen Joyce and Muir Mathieson in the same year as the film came out. It has a certain vogueish charm - pocket piano concertos then being rife in British film scores - and its Euro-African slant is at least novel (the film was set in Tanganyika). The four excerpts from the film are given fictionalised titles by Adriano in a bid for dramatic narrative continuity. Some arranging has proved necessary and African drumming sections in manuscript have had to be excised. Otherwise the score is fulsomely orchestrated and especially in the final cue full of brassy portent. The vocal writing is taut and effective. Nothing has lessened the appeal of this disc in the intervening years - short perhaps of the possibility of further reconstructive work on Seven Waves Away. Admirers of quality film music, and Bliss’s in particular, need no second invitation.